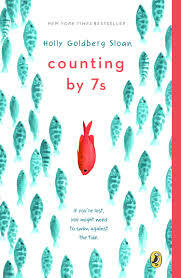 Counting By 7s by Holly Goldberg Sloan is the junior fiction title for the Convent book group's Mental Health theme this month, and I found it in the library (phew!). Twelve year old Willow has always been different; she is super-smart, she's the dark-skinned adoptive child of very white parents, and she doesn't quite fit in at school. But when her parents are killed in a car accident and leave her alone in the world, she has to find a new place to belong, and pull together some random strangers into a family. Counting By 7s seems to have swept the awards table in the year it was published, and it is undeniably a feel-good, uplifting tale, which features a nicely diverse cast of characters (Vietnamese family, Mexican cab driver etc). I read it quickly and easily. But for a number of reasons, it didn't quite work for me. Firstly, a minor stylistic quibble: the paragraphs are really short, often only a sentence long, which made the book quite choppy to read. After a while I got used to it, but in the beginning it really grated on me. Secondly, character quibbles: Willow's 'quirks' (counting by sevens, for example) didn't ever quite ring true to me. I think she was supposed to be Asperger-y, but she didn't consistently display Asperger-y behaviour. A review on Goodreads pointed out that she actually drops these behaviours when under stress, when they are actually coping strategies, which is a good point! I also had a problem with the frequent jumps from the inside of Willow's head into third person omniscient POV, and particularly the character of Dell, the incompetent counsellor, who just made me feel uncomfortable. Thirdly, plot quibble: there is a really implausible happy ending -- so implausible that it destroys the credibility of the entire novel. Not that (spoiler) Willow ends up formally adopted by her de facto new family, but that it's suddenly revealed that her new mother is incredibly rich, and has been all along… Hmmm. But a lot of people seem to have really loved this book, and I can see lots of reasons why. It just didn't quite do it for me. My copy of Rumer Godden's slim novel, The River, is not as pretty as this. It's a 1963 edition, once a school text (belonging to Robert Fletcher, VB) and covered in pencil marks. 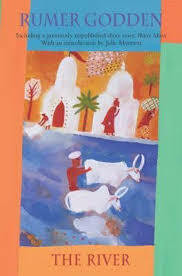 Published in 1946, The River was one of Rumer Godden's earliest books, and most elements will be familiar to anyone who has read other examples of her work: the Indian setting; the children living in their own world, only occasionally intersecting with the adults; the gradual unfolding of maturity, punctuated with sudden transformative experience; the vivid, evocative descriptions of river and garden, village and house. Godden would return to these themes again and again through her long career, but this short novel is just about a perfect encapsulation of her writing. I don't think anyone, alive or dead, writes as beautifully, gracefully and acutely as Rumer Godden. Fifteen year old Craig has succeeded in entering the selective, demanding high school of his dreams, but now he's having trouble keeping up with his peers. Depression has him by the throat. He can't sleep, he can't eat, he throws up all the time (I know how he feels). One night, gripped by suicidal thoughts, he checks himself into the nearest hospital and ends up spending five days in the psych ward. He meets and befriends some fellow travellers and starts to see a way out of the darkness. At the end of the book, he's not 'cured' but he knows that he's decided to live. It's Kind Of A Funny Story is not really funny, but it's highly readable and engaging. 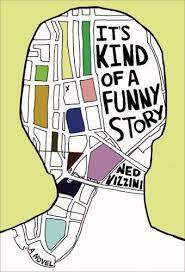 Ned Vizzini also spent five days in a psych ward near his parents' home the year before he wrote the book, so I think it's fair to surmise that it's based on his own experiences. In the book, Craig is forced to mingle with adults patients because of 'renovations' which smacked of plot device to me, a way that Vizzini could call directly on his own time in the ward and the people he encountered there. But I can forgive that. What I find harder to deal with is that I put down this life-affirming, encouraging book with its inspiring ending and discover that the author took his own life at the age of 32, seven years after this book was published. Does that fact detract from the positive, uplifting message of the novel? I guess that's something we'll talk about in book group. This book was an impulse buy that I gave myself for Christmas last year. It's been sitting beside my bed ever since, so I decided it was time I pulled it out and actually read it. Paranormality is a fun, informative ride, although it does bear disappointing news for those of us who Want To Believe that ghosts, telepathy and prophetic dreams might actually exist. Professor Richard Wiseman is always entertaining, but strictly scientific in his dismissal of such phenomena. 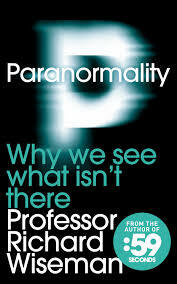 It seems that most seemingly paranormal events are the result of either suggestibility or tricks of the brain. Ultimately, our gift for finding patterns in our surroundings -- such a boon for our survival in the wild, enabling humans to predict and thus avoid various threats and dangers -- means that we literally see things that aren't there. Phantom faces, apparitions, spooky coincidences, messages from the spirit world, are much more likely to be our own senses jumping to conclusions that aren't really justified. Professor Wiseman includes a whole collection of do-it-yourself exercises to help replicate out of body experiences (drugs not recommended! ), successful fortune telling, the appearance of telekinesis and other supposedly 'inexplicable' phenomena, which are highly entertaining in their own right. As a reformed tarot reader, I had to chuckle at the fortune telling techniques he outlined, which were a bit too close to the bone! I'm recommending this book to my daughter, who took the subject Conspiracy Theories at school last term. I think she'll enjoy it. Wow, this is such a terrific book! 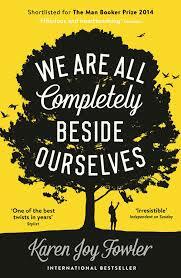 A brilliant idea, solidly and movingly executed by Karen Joy Fowler, a wonderful read and lots to think about. I won't reveal the Big Twist, in case there's anyone out there who doesn't know what it is yet. I knew about it before I read the book, and it intrigued me so much that I had to get hold of it at the first opportunity; knowing the twist didn't spoil the story for me at all, and anyway, it's revealed on page 77, so you don't have to read for long before you find it out. EDIT: I had completely forgotten that I seem to have abandoned Far From the Madding Crowd! So there you go, I'm already doing it! I took The Road from Coorain to Sydney with me last week, appropriately enough, as Jill Ker Conway spent her adolescence there, after her early rural childhood. Her family life was marked by tragedy, and her teenage years were not exactly happy ones, but Ker Conway's fierce intellect proved to be her eventual escape route. She is almost terrifyingly intelligent, observing and analysing every aspect of her surroundings, 1950s Australian society, her troubled family and her own psychology with a cool, pitiless gaze. The book ends with her planned escape to academia in the US in her twenties, where she lived for the rest of her life, ruthlessly leaving her dependent mother behind. 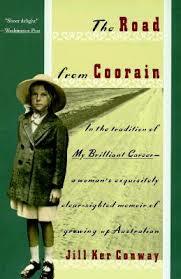 I found a lot to relate to here (though not, mercifully, her anguished relationship with her mother). Highly recommended.